By buying this product you can collect up to 78 loyalty points. Your cart will total 78 loyalty points that can be converted into a voucher of $15.60. The Polaris Vac-Sweep 380 pressure cleaner works in all in-ground pools, and requires a booster pump (sold separately). Featuring the iconic Polaris three-wheel design, the Polaris 380's all-wheel, belt drive mechanism provides greater vacuum power and faster cleaning (3 hours or less). 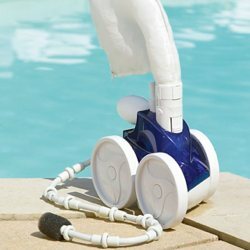 Powered by triple jets, the Polaris 380 sweeps, scrubs, and vacuums the bottom, walls, and steps of any size or shape pool, and it holds debris in its single chamber filter bag. Its unique filter bag removes debris before it reaches your pump basket or filter, prolonging the life of your filtration system. An in-line back-up valve automatically frees the 380 if it gets cornered and keeps it cleaning without interruption. Works in all in-ground pools (view larger). The 380 requires a separately available booster pump, such as the PB4-60. Polaris pressure pumps are specifically designed to operate your cleaner at optimum cleaning efficiency. The compact, rugged design allows for maximum performance. 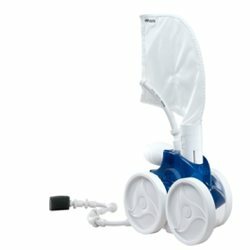 This pressure-side pool cleaner climbs walls and maneuvers over stairs, picking up large debris such as leaves, acorns and pebbles. Distributing heated water to the deepest parts of the pool as it cleans, the 380 will completely clean your pool in a few hours, giving you more time to enjoy it. The 380 collects and deposits debris before it reaches the pump basket or filter, reducing filter cleanings up to 80 percent, thus prolonging the life of the filtration system and reducing maintenance time.